Sew Inspired: finished quilt top! Here's my 9-patch quilt top, all done! I made it following the quilt-along at crazymomquilts. I have batting for it but still need to get backing and binding fabrics! I've made some progress on L's costume... found a tinkerbell t-shirt at Savers that I'll be cutting up and making into something really cool for her. I can't believe I found it, it's just perfect for her costume. Also wanted to share--I really loved this post over at zen habits today. I love the idea of relaxing and focusing on doing what you truly enjoy. this looks great. i have all my blocks but have never had the chance to assemble all that i made for that quilt along. i should do that...seeing yours is a great inspiration. 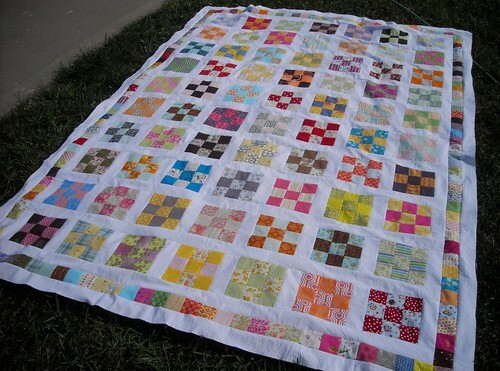 It a beautiful quilt! Can't wait to see it quilted Vicki! Yay! It is beautiful! Look at all those lovely nine-patches. And I love the pieced border. 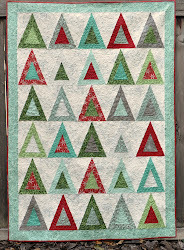 That is one beautiful quilt! Doesn't it feel good to have it together? I started that quilt along but didn't love the fabric that I started with and didn't finish. I might have to try again! Thanks for sharing.